All of my ideas about color in comics come from studying Herge's work. coupled with his low-contrast color made every panel easy to read and every page attractive. Herge keeps it flat, keeps temperature and value contrast low in his color, and keeps his storytelling as simple as possible. It's a brilliant formula for elegant, supremely readable comics. And we could use more of those. I am buying the TIN TIN comics for my 5th graders. Yeah I am trying to educate them little by little. I am so glad things went well last night. I miss you and Kat dearly. Please know I love you both and baby Strong can't wait to meet it's Godparents. This really makes me want to read TINTIN. Which I have never heard of (I'm still woefully comic illiterate). But that environment is beau-tiful. 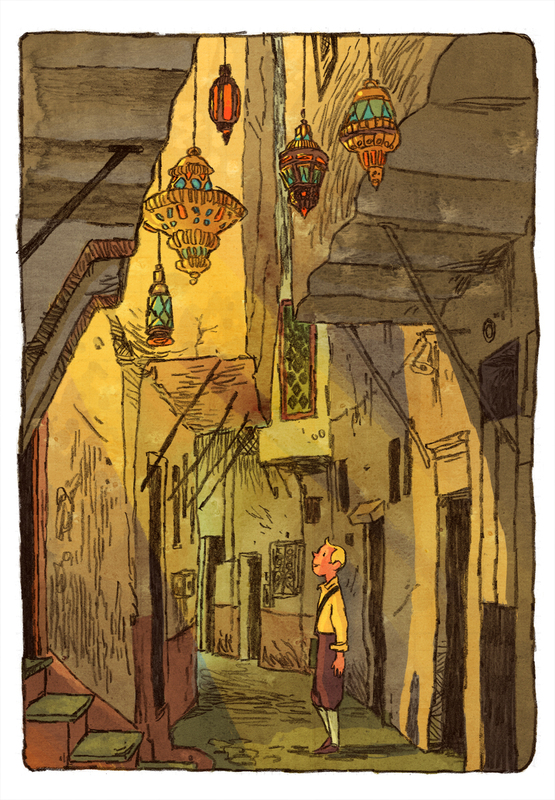 This Illustration really reminds me of the time I was at a bazaar in Cairo. Really great atmosphere. Is this scene you drew from a particular TinTin story? I gotta know. Not a particular story, no. Tintin is about indulging colonialist exoticism (before we all decided it that it was bad) and so I tried to get the essence of that. This is based on a few photos of Tangier from one of my clip files. For the record, though, my favorite Tintin story is The Blue Lotus. You can borrow it if you want, Jared and Simini. Wish the movie was looking like this. One of the best Tintin fanarts I've ever seen. Most usually look too close to Hergé's style, but without the technical expertise to pull it off. Ends up looking like Bizarro-Tintin. But this one gets the feeling of Tintin in a different style. It's really cool. Loves for Jake, Tin Tin, and Tangier. Love the warmth! very wondrous and welcoming. Beautiful!